Welcome to the IOOF Elgin Lodge #12 website. To navigate this website simply scroll this page down or click on the topics on the right hand sidebar. Articles, Lodge information, Elgin Lodge History, Videos, meeting and calendar of events, can easily be obtained at this sidebar. Thank you for visiting our website. 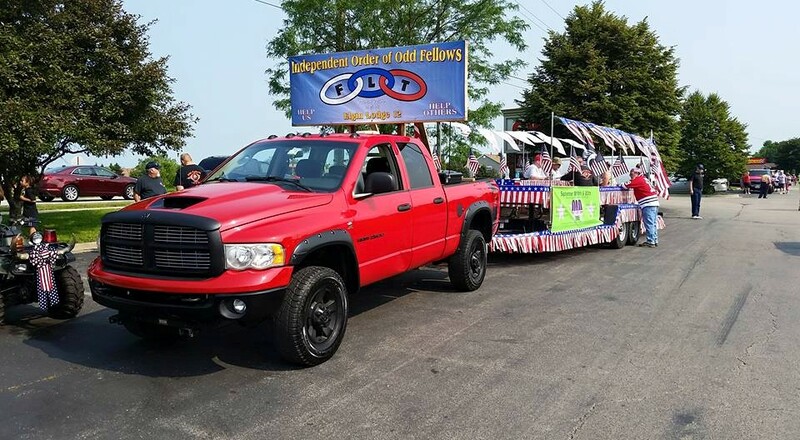 On July 4th 2015 the Elgin 12 Odd Fellows participated in the South Elgin 4th of July Parade. 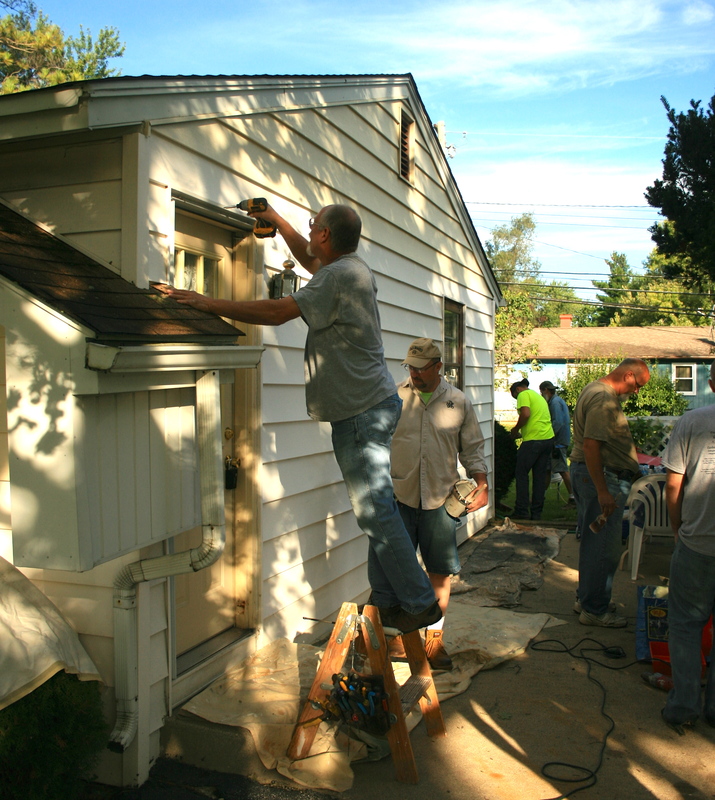 Don Blomgren preparing to install a new door on Walter’s house during the “house painting project. The winning raffle ticket for the Grill was won by Larry (Butterball) Clavel. was not only appreciated by Little Angels but also by his Lodge brothers and everyone present at the drawing. At noon on a beautiful 2013, September Saturday morning, Elgin #12 members, having packed up their paint brushes, rollers, tarps, scrapers and ladders, posed for this photo just before getting into their vehicles and heading off into the sunset. 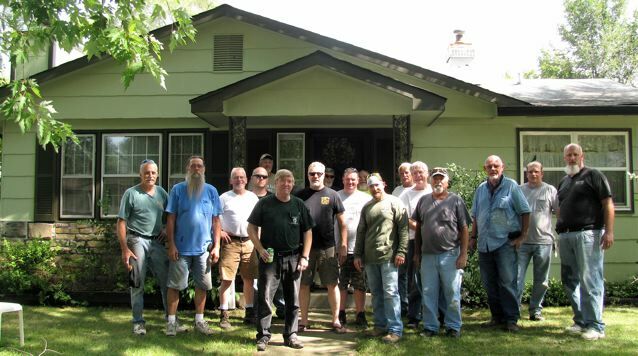 This bunch of Odd Fellows accomplished in four hours, a miracle of house painting prowess as another needy home in Carpentersville Illinois felt the touch of our charitable organization. Thank you brothers, you make our Order proud. 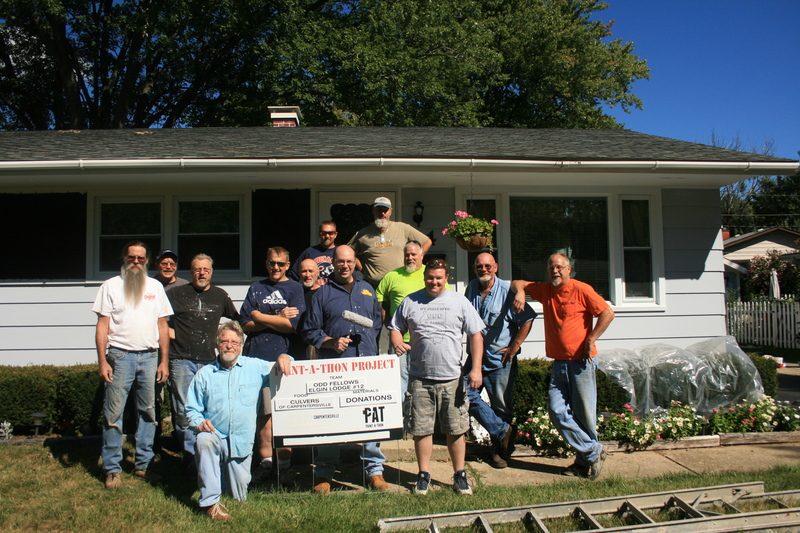 On a bright sunny day on September 9th 2012, thirteen members of Elgin Lodge #12 gathered at a home in Carpentersville for our annual paint-a-thon project. After 5 hours of scraping and painting the ladders, tarps, and brushes were gathered up and loaded in our vehicles, goodbyes were said and the elderly couple whose house we painted seemed totally elated with the results. 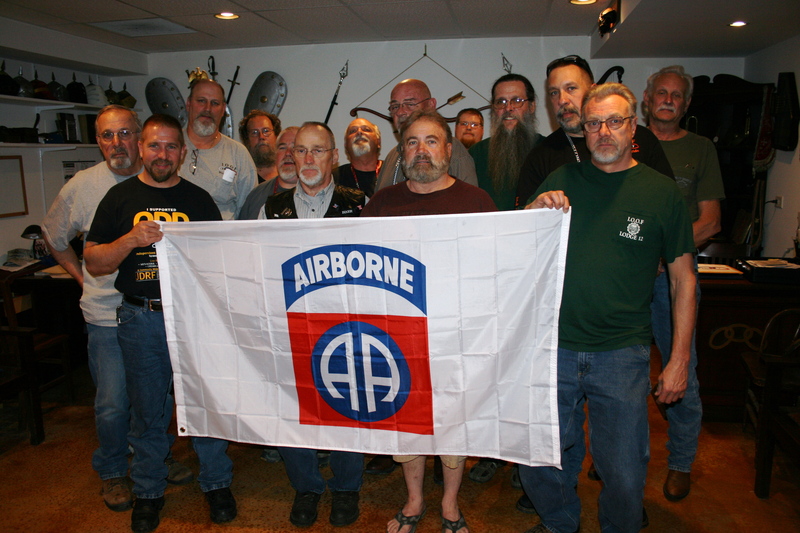 Elgin Lodge #12 members holding the Airborne flag sent to the lodge in exchange for an Elgin Odd Fellow Flag that the Solders will all be signing and returning to the Lodge. 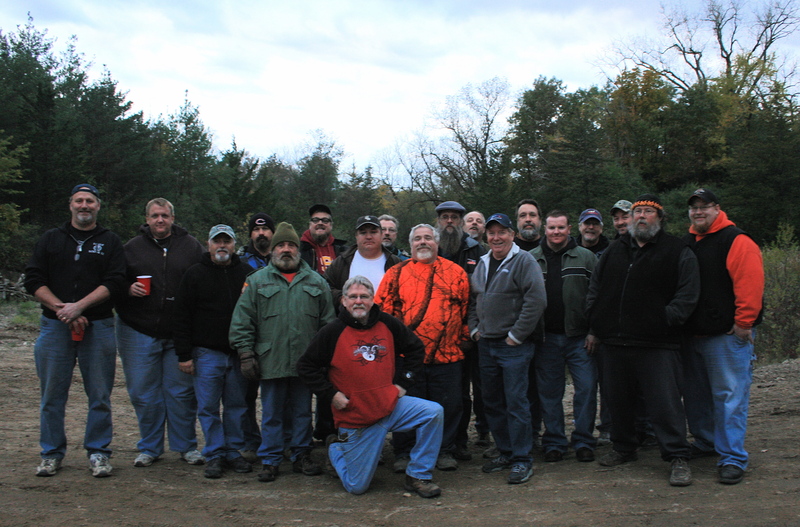 This photo was taken toward the end of the Breakfast/Donation event outside of the Elgin #12 Lodge Hall. 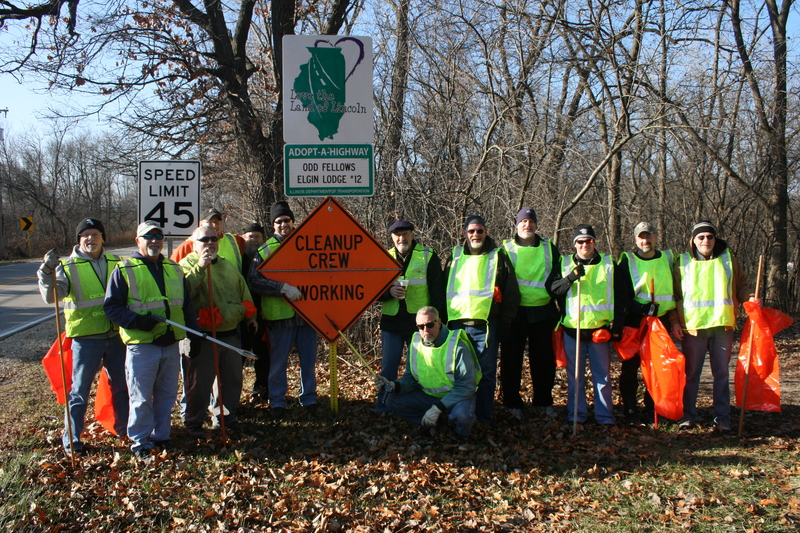 On a brisk Fall morning, Sunday November 28th 2010 to be precise, these hardy members of Elgin Lodge #12 braved the elements and cleaned up the section of an Illinois State Highway that has been assigned to them. A mile and a half of Illinois Highway 31 south of South Elgin is now squeaky clean as a result of their efforts. 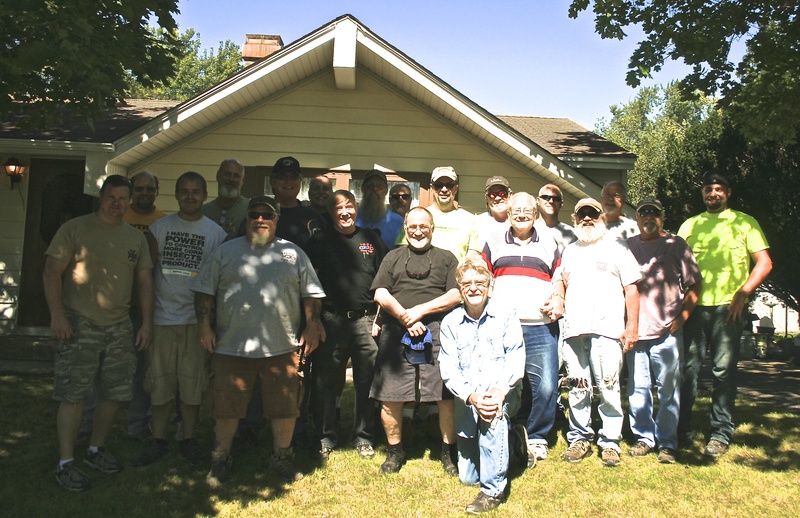 From left to right, Mike Melvin, Dave Martin, Larry (Butterball) Clavel, Nick Paxton, Ron Paxton, John Kirkman, Joe Pagone, Danny (Gascap) Blomgren (kneeling), Mike Schultz, Larry Sitkiewicz, Paul Riley, Mike (Dagwood) Lejsner, and Mike Turner. The photographer who is never in these event photo’s is Jim Turner (I’m also wearing a green vest). 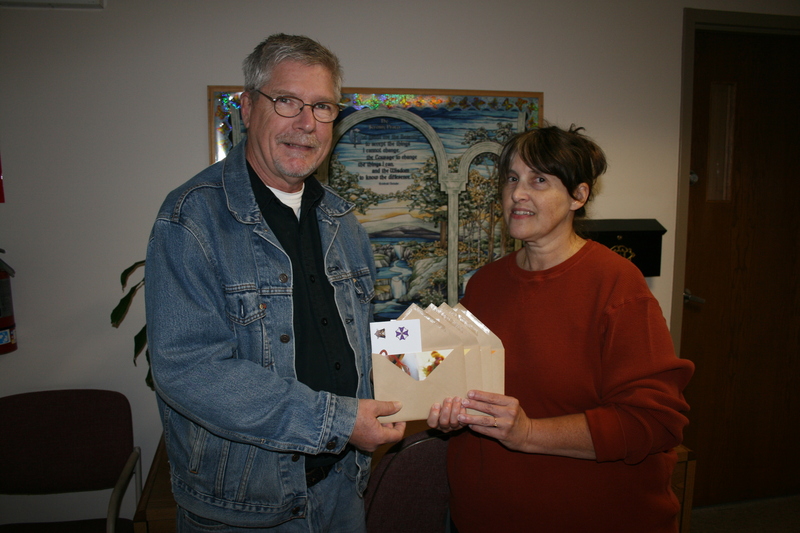 On Friday November 12th, Mike Turner representing Elgin Lodge #12, presented four $75 dollar Jewel Gift cards to Paula Dettman, the Secretary for the Community United Methodist Church of South Elgin and home of the South Elgin Food Bank. These cards will be handed out before Thanksgiving to 4 needy families in the South Elgin community. 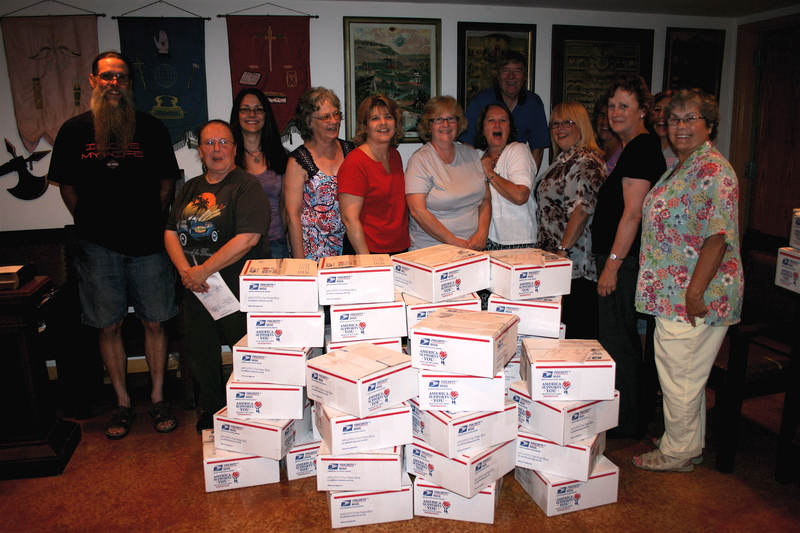 As Odd Fellows, we are trying to bring a little ray of sun shine to some families that are in need of help. 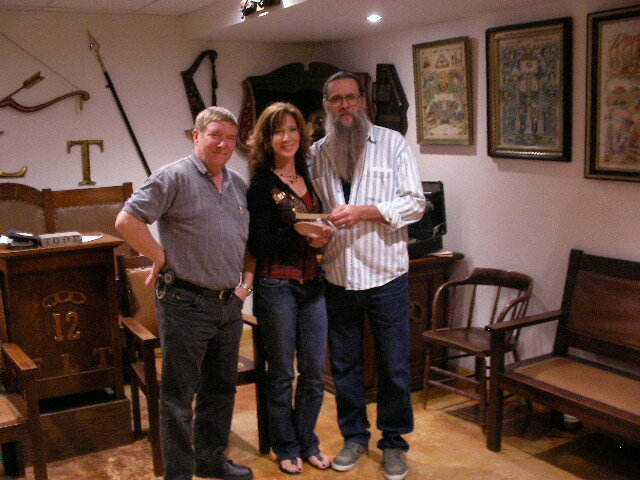 At the October 6th 2010 meeting of the Elgin #12 Lodge, NG Matt Gallois and PNG Bill Maplesden presented Kelly Lidbury of Whitewater Wisconsin, with a $1000 dollar check for being the winner of the Vacation Raffle drawn at the Elgin #12’s Annual Oddoberfest family picnic. Congratulations Kelly. Elgin Lodge #12 had it’s first official meeting in it’s new Lodge Hall on Wednesday evening June 3rd 2009. Approximately 40 people had dinner and helped celebrate our grand opening. 35 Odd Fellows from throughout the district attended this first meeting in our new lodge hall. The site looks great Jim. You’ve really mastered the concept and have it looking really great. Great Job!! Tell your neighbor she MUST come to brunch so we can repay her for all her work!!!! Nice job on the web site, I think this is what we’ve been looking for. Keep updating the site & again JOB WELL DONE ! ! ! Nice job Jim Keep up the good work. Thanks for the great job on the web site. Hey butter, I found it too! Great web page!! Looking for support for our Veterans at a poker run I organize through my electrical union. Its Sunday September 13th, first bike out by 10:45 $20 includes pig roast and chance at prizes. Location is 28600 Bella Vista Parkway Warrenville Il 60555. Was a big hit last year for the first run!! Love to see some of my bros Go! Greetings from I.O.O.F in the Philippines. This is a nice website and especially the pictures. Keep it up brothers and sisters. In Friendship, Love and Truth! We like to invite you club to join us on July 6th, 2013 in celebrating our 100th Anniversary of hosting the 1st sanctioned motorcycle race in the United States. More information is listed below. Please feel free to share any and all this. If your club would be interested in a FREE Vendor spot to promote yourself just let us know and we be glad to make that happen. Elgin National Motorcycle Show: A celebration 100 years in the making Elgin, IL â€“ One hundred years ago (July 4th, 1913), Elgin, IL was host to the first nationally sanctioned motorcycle race in the United States. 45 motorcyclists registered for the race, 43 made it to start the race, and 10 tough racers had the equipment, strength and endurance to complete the race. This year, on Saturday, July 6th, riders will meet in downtown Elgin’s DuPage Court (where DuPage meets Spring Street) to celebrate that first race, and all things motorcycle and scooter related. There will be a motorcycle and scooter show on DuPage Court, a ride along the original course, a burn out area, and live music. This event will have food, vendors, art, beer gardens, local restaurant and shopping for riders and their families. â€œThe event is FREE, but for a $10 registration fee, you can enter your motorcycle or scooter in the show. Registration starts at 10:00am, and the show will run from 12:00 – 4:00pm. Awards will be presented just before we make our commemorative ride along the original race route — at legally posted speedsâ€ said Alice Moring, one of the event organizers. â€œAfter the ride, cyclists are welcome back to DuPage court where they can listen to My Lazy Elephant, visit the burn out area hosted by the Elgin Fire Museum, visit vendor booths, view the art and photography area, restaurant or beer gardens.â€ If you’d like to learn more about the history of the race, or the racers who lived it, the Elgin Area Historical Society and Museum is hosting an event on Sunday, June 23rd, from 2:00pm â€“ 4:00pm where local motorcycle enthusiast Bill Moring will discuss the race, and John Arcand will present stories and memorabilia focusing on some of the original racers. Great Job on the upkeep of the website your lodge is a rock kudos to you all in F.L.T. ………………….